Christianity had come to Britain in Roman times but following the Roman withdrawal in about 416 AD and the steady conquest of what would one day be England by the Anglo-Saxon immigrants it was confined mostly to the lands under the control of the Romano-British Welsh (increasingly confined to the west) , the Irish and the Scots. 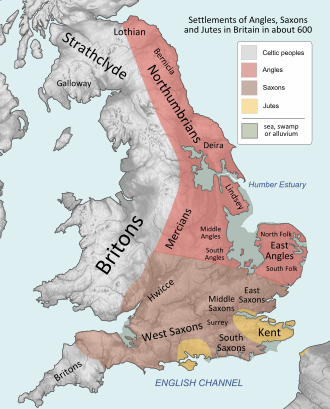 The vast bulk of the land under the rule of the Saxons was pagan. The church in Rome was certainly aware of the reversal of its fortunes in the former province of Britannia. According to legend Pope Gregory I (Pope 590 to 604) once saw fair haired Anglo -Saxon boy slaves in the forum in Rome. He enquired who these were and was told they were Angles to which he poetically was said to reply Non Angli, sed Angeli. (“Not Angles, but Angels.”) and determined that this race should be converted to Christianity. When he became pope he set about just this task. But he needed a man for the job. In the 580s Gregory had founded and been the Abbot of the Monastery of St Andrews on the Caelian Hill in Rome. One of his former monks had now risen to become Prior of St Andrews and it was to this man, Augustine and forty of his monks that Gregory now turned. Now in the year 595 Gregory asked Augustine to go to Britain and convert the English. We know little about Augustine prior to his appointment. He was probably the son of a wealthy Roman but beyond that there is a scarcity of information. This is NOT St Augustine of Hippo who wrote many of the religious essays that shaped medieval Christianity but a totally different man. There is uncertainty over where the idea of this mission originated. The official version is as we have seen that it was the idea of the pope. There has been a suggestion that Gregory was approached by Bertha the queen of Kent. Bertha was the daughter of a king of the Franks and a Christian. Her husband, Aethelberht of Kent was pagan but tolerated his wife’s religion. Possibly Aethelberht saw political advantage in requesting ties with Rome. In any event Kent was the logical choice for a mission. It’s ruler would not oppose their presence and moreover Kent’s alliance with Burgundy and the Franks would allow safe passage for Augustine especially after Gregory wrote to their rulers requesting assistance. Augustine’s route was laid out but after departing from Rome he and his party almost turned back in France. It needed another push from Gregory to finally get them to England in 597 AD. Kent and it ruler was receptive to the message. Baptisms and the establishment of a monastery soon followed and Aethelburht himself converted after some months. In Canterbury at the same spot where an old Roman church stood (St Martins) the foundations were laid for what would one day be the cathedral that today is the senior cathedral of the church of England. 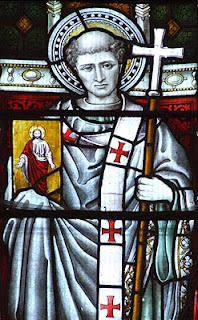 In 601 AD Gregory confirmed Augustine as Archbishop of Canterbury and sent more missionaries with instructions to appoint bishops, a plan to have an Archbishop at York (this would not occur for 25 more years) and also encouragement to spread out and incorporate other kingdoms under his authority. What to do about Pagan Temples and Traditions? As the Augustine mission expanded it was faced with the issue of the pre-existing pagan culture of the English and their temples and traditions. Should the Roman Christians ban the festivals and destroy the temples. The Pope sent instructions to Augustine on this matter via one of the new Abbots. So the church was to be pragmatic. It would re-use pagan temples as the people were already used to worshipping in them. They would not ban pagan festivals but adapt them. Saints days and holy days would often fit in which pre-existing pagan dates and so rather than expect the people to lay aside their parties and festivals they would be taken over as time of joy and celebration. Britain was not one nation. It was divided into Anglo-Saxon eastern kingdoms and Romano-British welsh western kingdoms as well as Irish, Picts and Scots. There were dozens of kingdoms and each of the Saxon lands were pagan. Some were receptive. Some very resistant. Some kingdoms would convert only to revert to paganism when a new king came along. Mercia would not become Christian until as late as the 8th century in parts. Never the less gradually Augustine was able to penetrate other lands and the Augustine mission was deemed a success. That was until he came across the Welsh. In around 603 Augustine requested a meeting with the Welsh bishops at a place known as Augustine’s oak – somewhere around the border of Mercia, Hwicee and the Welsh lands. From the start there was trouble. The Welsh bishops had maintained a Christian church in the land for 300 years. Forcefully separated from Rome by the English lands the church had evolved independently after Rome abandoned Britannia. This led to several differences. The method of appointing bishops, the timing of Easter, the approach to converting the pagan English and even the tonsure (the style of monks hair cut) was now different. Augustine insisted that the Welsh abandon their traditions and conform to Rome’s teachings. His attitude was so arrogant that the meeting broke up. A later meeting some months later was arranged. The Welsh bishops were uncertain how to approach it and sought advice from a wise man who suggested that they allow Augustine to arrive first and then go in. If he rose (as if greeting equals) then they should try and reach accommodation. In the event he did not rise and they realised then that he looked down on them and treated them as inferior. To Augustine’s mind HE was the Archbishop and these WERE inferior. The Welsh did not see it that way and left. It would take many years to reach accommodation after this failure. It is believed that Augustine died between 604 and 609 AD. In those brief few years he had re-established the Christian church in the land ruled by the English and set the foundation of the structure that would last until Henry VIII separated from Rome. Canterbury is still the seat of the Archbishop. So in that regard he was a success. His failings were arrogance as witnessed by his dealings with the Welsh. He is venerated as a saint in the Roman Catholic church and accepted as the father of the Church in England. Certainly his mission had a powerful effect on the evolving land that would one day become England. Book 1 of the Nine Worlds Series. Xmas Day 1914: where was the Truce? What did the Anglo-Saxons do for fun?